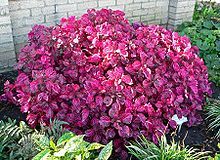 Iresine is a genus of flowering plants in the amaranth family, Amaranthaceae. It contains 20 to 25 species, all of which are native to the American tropics. The generic name is derived from the Greek word εριος (erios), meaning "wooly", referring to the trichome-covered flowers. Bloodleaf is a common name for those species that have colored foliage, and these are often cultivated as ornamental plants. Some species are additives to versions of the hallucinogenic drink Ayahuasca. Wikimedia Commons has media related to Iresine. ^ a b "Genus: Iresine P. Browne". Germplasm Resources Information Network. United States Department of Agriculture. 2007-10-05. Retrieved 2010-02-24. ^ Gledhill, D. (2008). The Names of Plants (4 ed.). Cambridge University Press. p. 217. ISBN 978-0-521-86645-3. ^ a b "Iresine". Integrated Taxonomic Information System. Retrieved 2010-02-24. ^ "GRIN Species Records of Iresine". Germplasm Resources Information Network. United States Department of Agriculture. Retrieved 2010-11-04. "Iresine P. Br. bloodleaf". The PLANTS Database. United States Department of Agriculture. This Amaranthaceae article is a stub. You can help Wikipedia by expanding it. This page was last edited on 26 May 2018, at 03:46 (UTC).